Recognition practitioners responsible for managing recognition programs work diligently to incorporate all of RPI’s 7 Best Practice Standards into their strategy and recognition plans. But what is more challenging for you now is the day-to-day operations and implementation of recognition throughout the organization. How can you get leadership commitment? What does it take to get managers to actually use your programs? 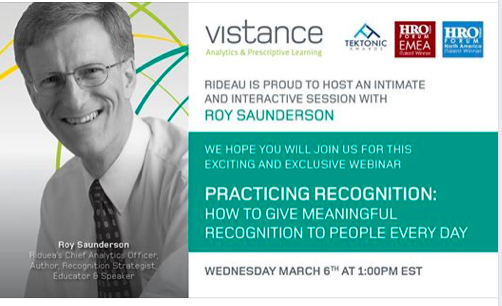 Why are your recognition programs not producing the metrics you had anticipated? Too often we seek out other organizations to learn about their best practices. Unfortunately, their best practices started several years ago and there’s no guarantee you could apply them in your company today. What’s needed is an upgrade of your “best practices” to become tomorrow’s “next practices”. Come prepared with your written questions addressing your current needs under any of the 7 Best Practices Standards. Or simply bring along one recognition question or challenge you’re struggling with right now. Do you ever feel intimidated at work? Are you nervous to share your ideas and speak up in a meeting? Many factors can have a negative impact on the physical and mental health of employees. Having a psychologically safe workplace enables people to feel they can value one another and express recognition. Recognizing an employee for their contributions is one way to positively contribute to their well-being. 01:45 p.m to 2:45 p.m.
What does Recognition have to do with Workplace Health and Safety?